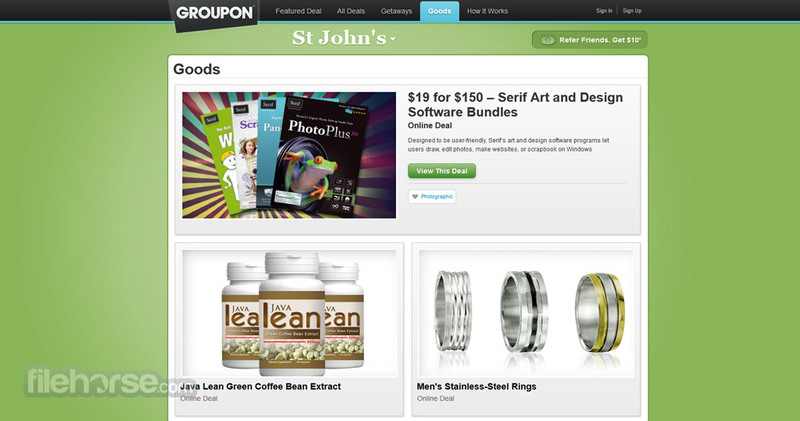 Groupon is an online social site that collects data from wide variety of online and offline retailers, offering you the easy way to find the best deals for items and service in just few seconds. With ability to access Groupon on your PC, mobile phone or other internet enabled portable devices, you will always have up-to-date information about best deals on the internet, with daily 40-60% discounts offered by Groupon itself. To provide best possible experience, all searches are customized for your location and your city. Instant service, great deals, and discovery of best places to shop await you if you choose Groupon to be your guide in the world of shopping. Discover daily deals for retailers, restaurants and service providers! It seems that online shopping has never been easier and convenient than today, but the ever rising number of e-retailers have created a situation that you cannot easily find the best deals without spending serious time on browsing and searching. To enable you and your friends to get the best deals possible for single and bundled items, developers of Groupon have created powerful web application that takes care of data aggregation for you and enable you to in few clicks find the best deals in stores around you and for specific object you desire. Created in 2008, this website has grown into popular service that is currently tracking sales data in many cities around the world, not only in US and Canada. With 300 employees who take care about servers and pic truly best deals that you will appreciate, this website represents site that you have to try if you want to save a lot of money in your pockets. Over 35 million users is currently saving their hard earn money, and now you could too! online and offline retailers! 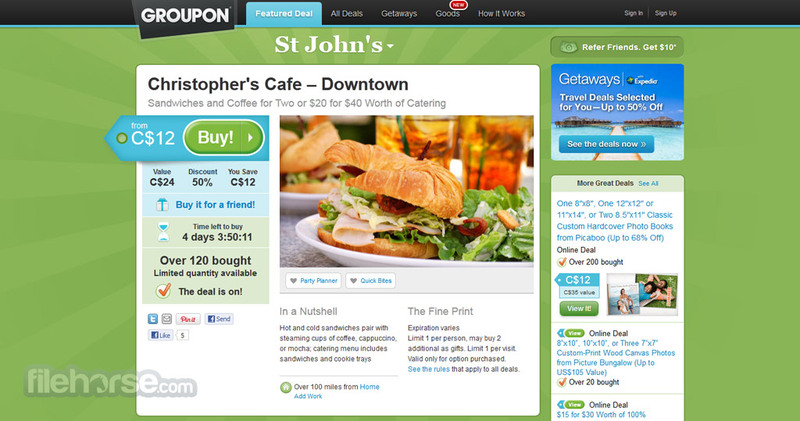 Groupon is not getting its sales data just by tracking what coupons are retailers giving in any given moment of time. No, this websites uses proactive measures in getting better prices. They gather data about what items their visitors prefer to purchase, and then negotiate deals with retailers for lower prices.This enables not only focusing on quality of items and best prices, but also gives users opportunity to purchase merchandize that is truly most popular and things that they really want to use. Deals are offered daily in every supported area, so users need to keep tracks of those deals before they disappear. Sadly, majority of deals lasts for only one day. Interface of Groupon is very modern and pleasing to the eye, enabling effortless browsing through the currently offered deals, with clear indication about time remaining to the end of the deal. Because Groupon secures their deals by guaranteeing larger purchase, you can only get that deal if the total number of buyers is above the pre-determined number that you can see on website. Only when the number of buyers is high enough, then you can really carry on with your transaction. You can visit site from any modern internet enabled device (desktop PCs, Mac, laptops, smartphones, and tablets) and engage into chat with likeminded people. 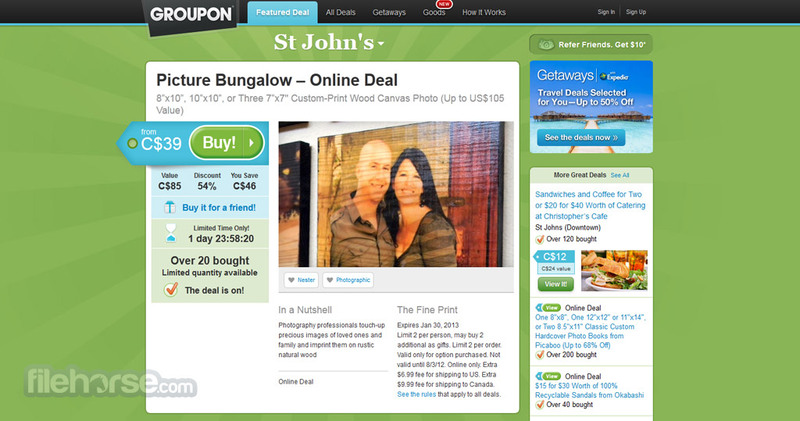 Registration on Groupon demands only to give them just your email address and the current city you are residing in. With that simple step, you will be able to login instantly and start browsing deals, and via email you will get regular updates about deals in your area. If you are traveling to another city, you can change your preferences by selecting option “visit more cities” on the Groupon website. As for cost, you can spend as little or as much as you want. Account creation is absolutely free, there is no subscriptions or in-site purchases of additional tools of features. However, if a daily deal pops-up and you want to buy it, you will be added on a wishlist for that item instantly. When enough users does the same thing and conditions for getting the deal become met, only then your credit card will be charged. If not enough users are found, purchasing deal falls through. Great online and offline retailers! Buying merchandize from internet with incredible deals is not something you can find easily on the internet, but Groupon makes that job effortless and fast. If you are currently living in one of the 100 supported North American and 150 European, Asian and South American markets, then you owe it to you bank account to start using Groupon.